We have grown with mythological stories of people who won over their enemies even when they had much less visible strength. The biblical text helps us understand this phenomenon through the winning spree of David over Goliath. Gladwell takes that as a reference and weaves the threads of different colors and translate that through this book titled David & Goliath: Underdogs, Misfits and the art of battling Giants. The efforts are put to narrate stories of different contexts and coincidences, different time and textures, and different people and places yet being one in spirit of underdogs defeating giants. The defense of the argument is placed in such a way through the research findings of academicians and practitioners that one tends to draw convincing conclusion towards the author's view. In the behavioral sciences there are numerous works to the effect that disadvantaged individuals have inherent strength of facing the challenges as posed to them as compared to the ones who are advantaged. The drive of proving better and asserting their positions are the learning that disadvantaged or suppressed individuals go through in their formidable years of life. This has been narrated by Gladwell in this title. He has tried defending the victory of David over Goliath through different stories of people who have excelled in their career and shown the world that their weakness is their strength. The book starts with the story of Vivek Ranadive, an Indian born, American educated engineer and entrepreneur, who is passionate about Basketball and NBA. He coached his young daughter and her friends to play in National Junior Basketball tournament representing Redwood City. 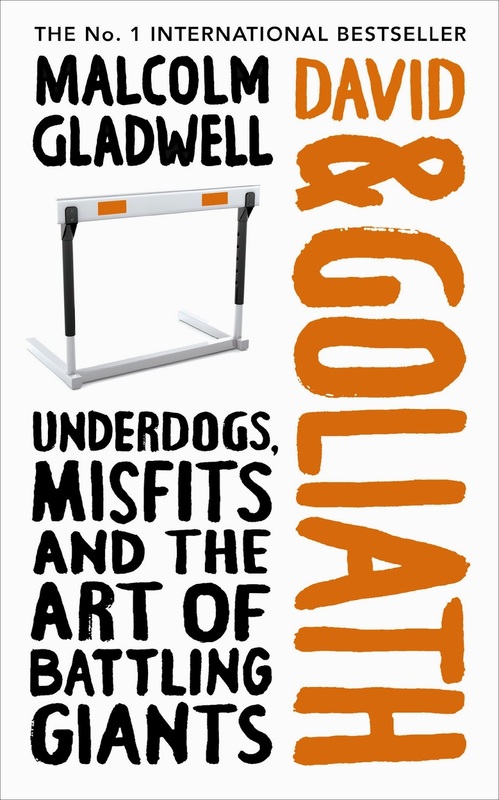 The strategy drawn, demonstrated and implemented in defending themselves and competing against established teams make it important and Gladwell traces the whole story to prove a point that Goliath is not quite the giant he thinks he is. The belief that powerful always wins tends to develop an arrogant attitude which makes an individual or team Goliath and there are Davids who are well aware of their physical (visible) weakness, yet they are convinced that it is not just the physical strength that is required to win but a well crafted strategy to attack at the given moment and given target which is more important and this could make them winner or if not winner at least shall help Goliath understand that size and arrogance does not matter. I get reminded of the book by JimCollins – How the Mighty Fall where through organizational examples Jim successfully convinces that it is the sense of arrogance in the Mighty Firms which make them fall in the long run. Goliath corporations have experienced that fall and David corporations have succeeded through their effective strategies and their efficient implementation in sustaining their growth. I quite liked the section where Gladwell explains different researches on American schools and colleges on the issues concerning choice of subjects, choice of school/colleges, general perception of students/parents towards them, performance of top/bottom students, physical facilities in schools and their fees, and their effect on students’ achievement ultimately. It is a real puzzle and it becomes extremely difficult to draw conclusion by just having an apparent look. As a classroom teacher the size of the class has always been one of the issues that we have been discussing over coffee or in formal meetings. The size or number of students in the class has a correlation with their performance and it depends on various conditions and level that what could be the ideal size of a class. It is almost impossible to generalize their number at all levels or in all conditions or for all types of students. However size does matter. Gladwell explains through various researches on American schools, colleges and universities and draws that there is inverted U relationship with number of students and their performance. Selection of colleges has always been a challenge for parent and children when they come out of school. Top students of schools aspire to join best colleges for the want of their better career. But since in the top colleges all the students are top students, many of them tend to develop an inferiority complex (as coined by psychologist Alfred Adler) and it gets reflected in the performance of students. This is quite evident across geographies just as the perception that better students opt for STEM (Science, Technology & Maths) courses in their college. Through few examples and researches Gladwell helps us understand this and help us develop a better perspective on the reality. Top students, who chose lesser known colleges but concentrate on their subjects of preference, tend to achieve better grades in their exams as compared to their counterparts who have taken admission in better known colleges. Arguably, this explains Big-Fish-Little-Pond Effect (as introduced by Herbert W Marsh). I learnt about Cognitive Reflection Test (CRT as invented by Shane Frederick) for the first time while I was reading Kahneman’sThinking Fast and Slow, and while I used it with some students myself, I found it really worth saying that it is one of shortest intelligence test that we have today. Gladwell argues using this test as a reference for the theory of desirable difficulty as through fading off the print color (experimented by Alter and Oppenheimer) of the same question of CRT which improved the performance of the students. He further relates it to dyslexic people. We have seen many prominent personalities like Einstein, Pablo Picasso, Graham Bell, Henry Ford, Agatha Christie, Richard Branson, and many more, who were dyslexic. Being dyslexic did not deter them to achieve greater heights. Rather as Gladwell argues their desirable difficulty level was high which drove them to concentrate and focus on the difficulty and that is what made them winner at last. It could well be defended this way. However practically it is hard to believe that just to increase the level of desirable difficulty any parent would ever wish to have dyslexic children. He narrates the journey of dyslexic David Boies from his difficult childhood to his entry into law school and then of becoming one of the most prominent lawyers of United States. Similarly journey of Gary Cohn from unassuming treatment by teachers in school to a job selling aluminum siding and window frames to becoming president of Goldman Sachs is also very interesting. The journey of Emil Jay Freireich has been narrated brilliantly and in very exhaustive manner by Gladwell. At times the account given in the text looks like a fiction. Freireich’s personality helps us understand many more things than what Gladwell intended and expressed. However this is an exceptional story and any kind of generalization shall destroy the defense that this book is eyeing for. The story woven through the picture as appeared in the New York Times taken on 3rd May 1963, by Bill Hudson in Birmingham, Alabama, where Martin Luther King Jr.’s activists had taken on the city’s racist public safety commissioner Eugene Bull Connor, is excellent and narrates the contemporary politics and power and how the approach and behavior of Wyatt Walker transformed the local behavior. We have all different ways to dealing with the losses, some resolve to take revenge, some put efforts to reason it out and tread through their actions (e.g., Reynolds known for Three Strikes Law) and some consider it to be the call of the nature and accept it and move on with life (e.g., Wilma Derksen’s family). It is extremely difficult to pass a judgment as to who/what is right and who/what is wrong. The loss of a child for some parents is such a loss that throughout life they can’t forget it and for some life moves on easily. It is part of their personality. This point has been expressed in few chapters on the limits of power. Dyslexia, single-parent childhood, individuals with low visible strength, school dropouts, etc are not desirable traits even when they might have proven as defendable strength through this text. The defense through citing research findings makes this book rich, however it suffers from problem of ‘selective perception’ to defend one’s argument as no scientific selection procedure has been followed in choosing the research papers and literature that is cited to prove a point or otherwise. Even the earlier work of Gladwell– Outliers, suffered from the same problem of generalizations. The lessons learnt from David and Goliath could be seen from the perspective of organizations as well and that is where I feel this work suggests some kind of direction. We have seen arrogant and failing business organizations, we have seen big/giant yet humble organizations. Historical facts, events and personalities are so well contextualized that it provides a valuable documentation for the benefit of reader who might not have had interest in contemporary history. He needs to be acknowledged for this contribution of him. Overall though Malcolm Gladwell succeeds in keeping the reader close to the book till last, yet towards the end it goes beyond context and finds last few paragraphs to establish connectivity. No doubt he is a great storyteller but at times it seems he gets carried away with a feeling that he is writing non-fiction and his kind of generalizations may not be welcomed by all of his fans and readers alike.